I am an aching shell but her touch says I am worth tenderness. 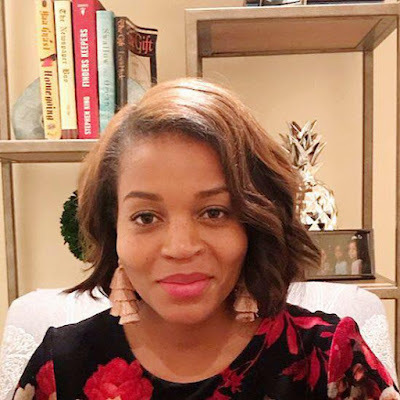 Kwoya Fagin Maples is a writer from Charleston, S.C. She holds an MFA in Creative Writing from the University of Alabama and is a graduate Cave Canem Fellow. She is the author of Mend (University Press of Kentucky, 2018). In addition to a chapbook publication by Finishing Line Press entitled Something of Yours (2010), her work is published in several journals and anthologies including Blackbird Literary Journal, Obsidian, Berkeley Poetry Review, The African-American Review, Pluck!, Cave Canem Anthology XIII, The Southern Women’s Review, and Sow’s Ear Poetry Review. 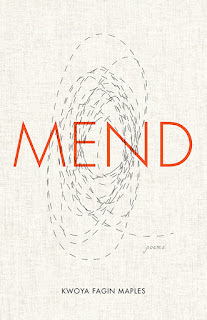 Her most recent poetry collection, Mend, was finalist for the AWP Prize. Mend tells the story of the birth of gynecology and the role black enslaved women played in that process. This work received a grant from the Rockefeller Brothers Foundation. Maples teaches Creative Writing at the Alabama School of Fine Arts and directs a three-dimensional poetry exhibit which features poetry and visual art including original paintings, photography, installations and film. In the 19th century, James Marion Sims performed experimental surgery on enslaved women. In Mend: Poems, Kwoya Fagin Maples gives voice to the enslaved women named in Sims' autobiography: Anarcha, Betsey, and Lucy. In poems exploring imagined memories and experiences relayed from hospital beds, the speakers challenge Sims’s lies, mourn their trampled dignity, name their suffering in spirit, and speak of their bodies as “bruised fruit.” At the same time, they are more than his victims, and the poems celebrate their humanity, their feelings, their memories, and their selves. A finalist for the Association of Writers and Writing Programs Donald Hall Prize for Poetry, this debut collection illuminates a complex and disturbing chapter of the African American experience. Kwoya Fagin Maples and I met when we did a reading together, along with Kate B. Gaskin, at Desert Island Supply Co. in Birmingham, AL. She gave a powerful reading from her manuscript Mend before it was published and I am delighted to be able to interview her about now that it has been introduced into the world. All of my children have died or wandered away. Here are the milk and songs from my breast. Take it for nights when he is cold. to catch him when he came. It was to give him a clean start. Take the old dresser drawer I meant for a cradle. You can carry him against your back. that they used to cut the pain. I did not want to mark him sick. But here is pine-top tea, and elderbrush. Here are mullen leaves for when he cuts teeth. Here is his corn husk doll. so he would rest against something soft. a prayer on my lips. Please tell us how you decided on the title for the book. KFM: The title is related to my purpose for the collection. I wrote Mend in tribute to the women who suffered under Sims’ hands. This book is an effort to bring to light this injustice, to elevate and reverence these women’s story, and to continue conversations regarding the current medical treatment of black mothers’ bodies. (Due to persistent medical biases, black mothers are still 3 to 4 more times likely to die after childbirth. In 2019.) This book was written to counter the previous inaccurate and harmful portrayal of this history. It was written to invalidate perceptions that people have of black women and our ability to bear pain. Mend is my attempt as a writer, a child of my ancestors and a mother, to fix something. At its core, persona poetry forces poets to better identify themselves in order to take on another’s perspective. After all, how do you become someone else without defining who you are, in addition to who they are? While poets construct poems from the view of their chosen characters, the resulting poetry is their own. Whether through use of vocabulary, syntax, or punctuation, poets shape others’ voices into wholly unique works of art. Therefore, persona poetry says as much about the poet as it does her subject. The way that personas are presented on paper provides great insight into poets’ sense of self. Did you find the above true for you? Please tell us a bit about voice and persona in your poems. Have you ever started a persona poem and had the poem take a turn away from persona to the personal? KFM: I’d certainly agree with Chu. My attempts to purely portray individual voices in persona are sincere, but ultimately the voices I create are influenced by my own. There is no way to cleanly separate the poet from the voice of the speaker. My aim with Mend was to be as accurate as possible based on research. I made an attempt to let go of the writer and editor within me to allow what the women could have said and how they would have said it take the lead. Here’s a small example that was indicative of a greater struggle: there’s a line from the poem, “Prayer Meeting,” wherein the speaker meets a guy she is attracted to. She describes him as having, “the straightest string of pearls for teeth.” It almost makes me laugh to think about how difficult it was for me to not edit that line. All of my training as a writer makes this line uncomfortable because I see it as a pat and expected. However, this description for teeth could have been familiar to the speaker. I was also trying to create the impression of the story being shared during conversation. While writing Mend, word choice, vernacular and syntax were a struggle. Voice was constantly in question. My biggest question: how do I allow these women to speak their story with authenticity without making the writing appear less poetic? How does an enslaved woman—who may have never made it past the end of her captor’s land—speak? What made the final decision was my initial desire—which was to write a book in tribute to the women of this story. To set aside “the editor,” more often than not. I also decided that if the writing was too heavy with vernacular, it could be too big of a distraction to the reader. “The Door” was the first poem I wrote for the collection. It is written in my own voice. Without knowing it was the first poem I’d written for Mend, my editor chose it to be the prefatory poem of the book. After that first poem, I decided I would not write towards this collection until after I’d spent time reading about it. A year later, after research, all of the poems came in persona. I’d spent a significant period of time reading slave narratives and those voices significantly impacted Mend and the way the voices of the women were portrayed on the page. After truly considering the story, I knew I’d have to write in the voices of the women if I wanted to convey their humanity. They’d already been portrayed as extras in their own lives by Sims. After the experimentation in Mt. Meigs, Sims wrote an autobiography entitled Story of My Life, and only briefly referenced the women. For contrast, quotes from Sim’s autobiography are included in the book. The voices of Mend serve as a direct refutation of his story. The second section of the book contains poems about your research travels to Mt. Meigs, Alabama, where James Marion Sims lived and conducted his experiments. I imagine that was not an easy trip to make. Please tell us a little about your experience there. Once I arrived in Mt. Meigs, I found hardly no one there knew the story. When I went to the library I met a local historian of Mt. Meigs and she told me that she’d heard of Sims. She said that he operated on an African American woman and saved her life. I was startled at how distilled and inaccurate the story had become over the years. From at least eleven women to one. For the operation being essential to save a life. It was hard to believe. The sonnet corona “What Yields”, in which Anarcha addresses James Marion Sims, is unflinching. Please share a bit about the writing of it and about the sense of harvest or plantation that threads through the sequence, beginning with the title. KFM: In this section of the book I handled voice differently than anywhere else in the work. “What Yields” is an eleven-sectioned sonnet corona and there is one speaker, Anarcha—the woman who endured the most surgeries (beginning when she was 17 years old.) Sims conducted his first experiment on her and she was also the one he claimed to have “healed” by the end of his experimentation in Mt. Meigs. In every other part of the book the voices are not overtly resistant. However, in “What Yields,” Anarcha confronts Sims. The language, voice, and syntax is markedly different here. Anarcha is assertive and direct in her resistance. She clearly expresses her disgust and anger towards Sims and references the ideologies that allowed him to consider her unworthy of human consideration. The title of the poem, “What Yields,” is based on a concept found in Harriet Washington’s book, Medical Apartheid. In her book, Washington uncovers several cases of exploitative medical experimentation on black bodies throughout history. During slavery, Sims was not the only doctor who utilized enslaved bodies for experimentation without their consent. He was one among many doctors who profited and built their family’s wealth on the backs of enslaved people. Washington says that these doctors were usually not plantation owners who oversaw crop production. Instead, they profited from what she terms as “medical plantations.” The medical discoveries they made in the name of scientific advancement contributed to their career advancement and wealth. While writing the poem, I considered the idea of the medical plantation in connection with the story of Mend. Sims is now known as the father of gynecology and obstetrics. He developed the speculum which is still used today. After that four year period in Mt. Meigs, Sims published his findings, moved to New York and became well-known and admired by his peers. He opened a hospital, traveled to Europe where he examined and aided a member of the monarchy, and finally established wealth for his family. Sims’ “medical plantation,” in Mt. Meigs yielded greatly, indeed. What is one of the more crucial poems in the book for you? Why is it important to you? How did it come to be? KFM: One of my favorite poems in the book is “I’ve Got Life.” In the poem, the speaker considers what she still possesses in spite of what happened to her, and she wields a subtle resistance—by watching. Who’s to say what she’ll do with the details she collects? The poem is celebratory and almost joyful, but then it ends with a threat. I think this kind of dichotomy appears a lot in the collection. The impulse for joy and survival is often combined with darker emotion or imagery. But then that’s life—the human experience is complex, and it would have been no different then. I also like this poem because it serves a break for the reader. It’s also an opportunity to highlight the speaker’s resilience. and this heart that only God can stop. so I don't sit on my spine. These lips only move if I tell them to, if I want them to. There is so much my body can still do. Plus, I've got these eyes for watching you. As your first full-length manuscript, when Mend was published, were there things you thought would happen, yet didn’t? unexpected things that did happen? KFM: Something unexpected that happened during the publication process of Mend that I could never have anticipated: I organized a protest. Sims has statues dedicated to him in New York, S.C., and Alabama. Months following a 2017 NY protest that went viral on social media, Sims’ monument was removed from its Central Park location. Still months later, the mayor of Columbia, S.C. stated that of all the statues at the S.C. statehouse, the Sims monument should be removed. After I read his statement, I immediately began making calls. Finally, I got in touch with a current MFA student at USC, Joy Priest, and she and I planned a protest on the statehouse grounds. It was indeed poetry as protest. All day and throughout the evening USC students and local activists read poems by women writers in protest, directly in front of the Sims’ monument. It gained media coverage and I was proud when a participant shared that it was the most peaceful protest that she’d ever attended. I’d attended protests in the past but I’d never organized one. The story of Anarcha, Betsey, Lucy and the unnamed women has impacted me in ways beyond what I could have ever imagined. You, Kate Gaskin, and I read together at Desert Island Supply Company in Birmingham, and I was so moved by your reading. You’ve given a number of readings since then. What has the audience response been in general? Did you encounter anything you were not expecting? KFM: The audience response has been varied. Some people have said they feel disturbed and saddened with the reality of the story. Mend has particularly moved mothers in audiences. There are several poems descriptive of nursing or losing children. “My Mother Bathes Me after I Give Birth,” a poem written in my own voice shares my personal experience with childbirth. I suppose if there’s any emotional reaction from audiences that I prefer, it’s to that poem. Childbirth can be emotional traumatic and I suppose it’s validating when I can share my story and know another woman understands completely. Lastly, I have a couple of poems in the collection that are humorous—regarding my trip to Mt. Meigs for research. It’s always nice to feel the audience loosen up and laugh. I let them know it’s intended to be funny and that it’s okay to laugh. When do you remember first being interested in poetry? Was there a mentor who encouraged you? KFM: I became interested in poetry when I was about 14. I’ve always been an avid reader. Maya Angelou was the first contemporary black poet I read. I’d read several of her autobiographies so I felt like I knew her. When I read her poetry it was accessible because I’d began with her prose. I suppose at first I read her poetry like it was a translation of her narratives. I was thrilled to find this mysterious way of writing in what I thought was a secret code within the English language—with ideas hiding in plain sight that had yet to be discovered. The idea of it was intoxicating. I already loved language and I was secretive teenager (laughing here). It was a perfect fit. I began writing poems by mimicking her writing style and using similar themes. After I read all of her books of poetry, I kept going and it took off from there. Later, in undergraduate, Abraham Smith became my mentor. He went above and beyond—did more than he had to. I took my first poetry workshop with him, and even after the workshop was over, he offered to read our poems. Every week I submitted a poem to his box in the main office of the English Department, and every week he’d respond with notes and tiny stars on my poems. He was what Maya Angelou would call my rainbow in the clouds—a person who invested in me and made all the difference. Finally, what advice would you give to an aspiring writer? KFM: Read. Read widely. Spend time thinking about the ways in which the writing you encounter is successful. No literary organization, journal or prize should decide the future of your writing. Seek community. Go to open mics and readings. Participate in local workshops. Be respectful of feedback on your work. Be generously and lavishly patient—with yourself. 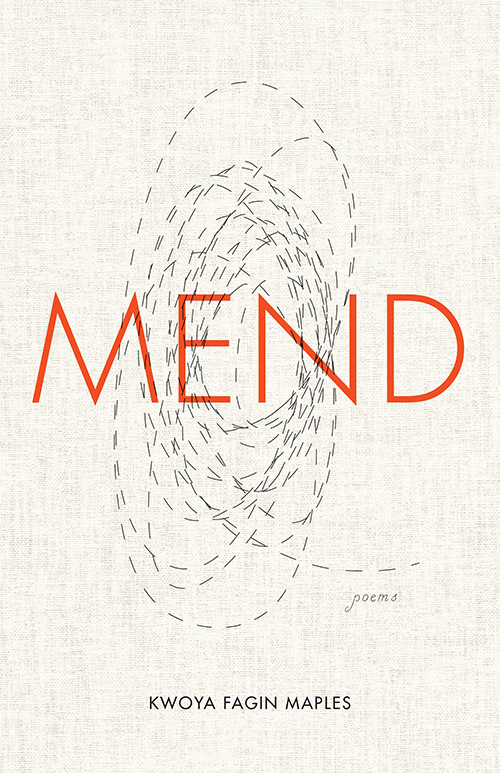 All poems printed or quoted in this post © Kwoya Fagin Maples, Mend (Univ of Kentucky Press, 2018), used with permission of University Press of Kentucky. Nancy Chen Long is the author of Light into Bodies (University of Tampa Press, 2017), winner of the Tampa Review Poetry Prize. She is the grateful recipient of a National Endowment of the Arts Creative Writing fellowship and a writer residency at Ox-Bow School of the Arts. Her work was selected as the winner of the 2019 Poetry Society of America Robert H. Winner Award and featured in Poetry Daily, Verse Daily, and Indiana Humanities. You’ll find her recent work in Ninth Letter, Pleiades, Smartish Pace, The Adroit Journal, Tar River Poetry, Alaska Quarterly Review, and elsewhere. She works at Indiana University in the Research Technologies division. Thank-you for sharing your thoughts with us!